Nobel Prize (Physics) for Shuji Nakamura. He is also a member of our university (TUAT) Administrative Councilors. 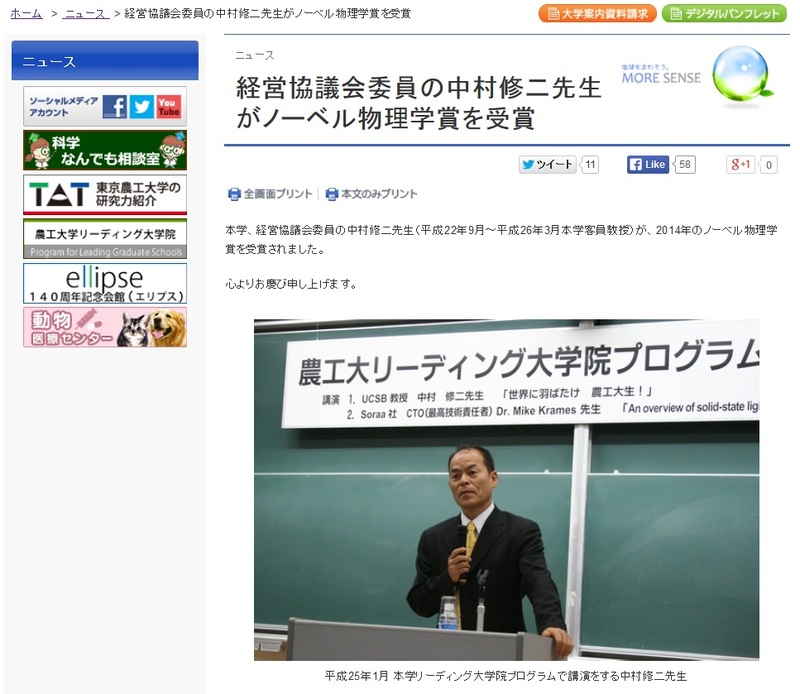 Dr. Nakamura graduated from Univ. of Tokushima (Bachelor 1977, Master 1979, Doctor 1994). The key technology for blue LED was discovered in Nichia Corporation (Tokushima) where he joined this company in 1979. He left Nichia in 1999 to joined University of California. High-quality gallium nitride (GaN) film was obtained for the first time using a GaN buffer layer on a sapphire substrate. An optically flat and smooth surface was obtained over a two-inch sapphire substrate. Hall measurement was performed on GaN films grown with a GaN buffer layer as a function of the thickness of the GaN buffer layer. For the GaN film grown with a 200 angstrom-GaN buffer layer, the carrier concentration and Hall mobility were 4 x 10(16)/cm3 and 600 cm2/V.s, respectively, at room temperature. The values became 8 x 10(15)/cm3 and 1500 cm2/V.s at 77 K, respectively. These values of Hall mobility are the highest ever reported for GaN films. The Hall measurement shows that the optimum thickness of the GaN buffer layer is around 200 angstrom. A novel metalorganic chemical vapor deposition (MOCVD) system, which has two different flows, has been developed. One flow carries a reactant gas parallel to the substrate, and the other an inactive gas perpendicular to the substrate for the purpose of changing the direction of the reactant gas flow. The growth of a GaN film was attempted using this system, and a high quality, uniform film was obtained over a 2 in. sapphire substrate. The carrier concentration and Hall mobility are 1 x 10(18)/cm3 and 200 cm2/V s, respectively, which are the highest for GaN films grown directly on a sapphire substrate by the MOCVD method. By: ROYCE, MR; NAKAMURA, S; SHINOMIYA, G; et al.